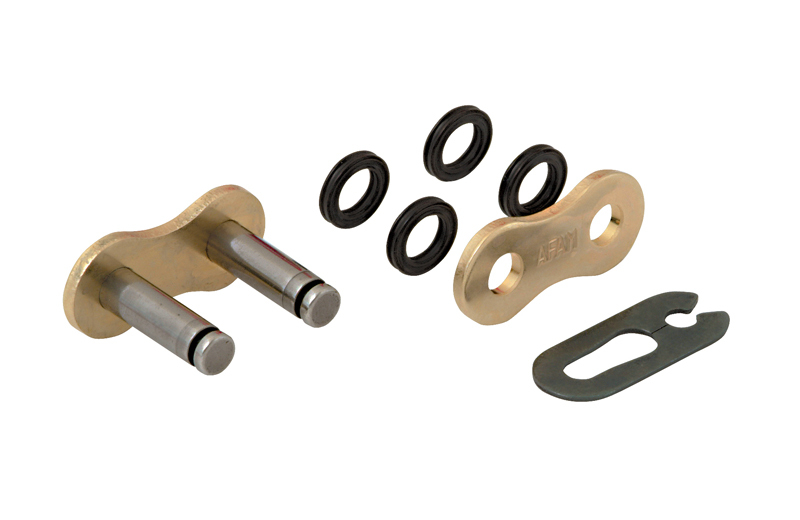 For the open chains, AFAM offers clips and rivet type connecting links. For light-duty motorbikes, clips are particularly suitable – for high-performance motorcycles we strongly recommend rivet type connecting links. The special tools suitable for assembly are, of course, available at AFAM. Mount your connecting link with the utmost care, grease well the pins and X-rings and rivet properly. AR: Standard connecting link with clips. Only for use with mopeds and light motorcycles. MR: Rivet type connecting link with flat pin head. Square riveted, this connecting link has the same shape as the other links in the chain. MRS: Rivet type connecting link with hollow pin head. Standard with all Xs-Ring chains and allows you to easily rivet your chain with the AFAM EASY RIV5 tool. This device enables you to push easily the lose plate on the pins at the right distance and pressure for the Xs-rings and rivets your connecting link.